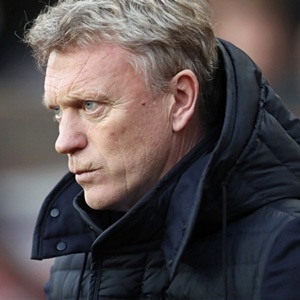 London - David Moyes saw West Ham secure a first point of his reign as the Premier League strugglers' manager in a 1-1 draw at home to Leicester City on Friday. The hosts fell behind early on at the London Stadium to a goal from Marc Albrighton before Cheikhou Kouyate equalised on the stroke of half time. But neither side were able to conjure up a winning goal in a low-grade contest. The point gained left West Ham still in the bottom three, albeit goal difference alone was now keeping Moyes's men in the relegation zone ahead of the remainder of this weekend's fixtures in English football's top flight. But the fight they demonstrated helped restore relations between the club and their fans, who turned on the Hammers board and players alike following a miserable defeat at Watford. "It was a start for us tonight," Moyes told Sky Sports. "The fans were fantastic, after all the negatives we heard, it was the opposite. "When you come to play West Ham over the years, it has been a tough place to come with a tough crowd they did that tonight," the Scot added. "They got right behind the players and the players gave them something back. "The players have set the standards today, but that only got us a draw. We need to keep that up if we want to get more from games." Meanwhile Albrighton indicated Leicester were content with a draw that saw them move up into 11th place, saying: "We will come away happy with a point, we knew it would be a tough game... A point is fair." Hammers supporters could have been forgiven for thinking 'here we go again' after Leicester went 1-0 up inside just eight minutes with their very first attack. Foxes midfielder Wilfred Ndidi won the ball in the middle of the pitch and released England striker Jamie Vardy down the left channel. The striker surged forward and then some poor defending, with Angelo Ogbonna falling over, saw his cut back come to Albrighton who scored with a sliding first-time shot from 10 yards out. Leicester enjoyed the space the Hammers left between their defence and midfield, with Riyad Mahrez running free as the Foxes turned defence into attack in a matter of a few passes. But, significantly, they were unable to double their lead, although it needed a desperate tackle by the Hammers' Marko Arnautovic to win the ball off Vardy when the forward was on the verge of shooting in the box. West Ham then started to work their way back into the game, with Leicester goalkeeper Kasper Schmeichel making his first notable save of the match in the 26th minute when he dived to push away an Ogbonna flick-on following a Manuel Lanzini free-kick into the box. An open contest then saw Leicester go close to a second goal when, from midfielder Vicente Iborra's excellent chipped through-ball, Vardy saw a curling shot fail to bend sufficiently after aiming to steer the ball inside the far post. Leicester were made to pay for an inability to make the most of their early dominance when West Ham scored their first goal under former Everton, Manchester United and Sunderland manager Moyes on the stroke of half time. Lanzini's well-struck corner left Schmeichel in no-man's land and Kouyate climbed highest to head home, the ball hitting defender Danny Simpson's shoulder before finding the back of the net. Both teams found it difficult to create clear-cut chances in the second half, although Hammers substitute Andre Ayew went close with an overhead kick late on.